I was cranky. I was close to eating all the things. I was not my normally joyful self. It crept on slowly over the course of months, but it was definitely more pronounced in the last few weeks. I’d been eating “right”. I was getting up at 4:30 every morning to work out just so I could be sure to get in my exercise. I was going to bed at a reasonable time and falling asleep (after reading a while) at a decent hour. I looked at the history of my FitBit and the answer was staring me right in the face. Despite my getting to bed early enough for that 4:30 AM wake up – I was getting an average of 5 hours of sleep a night. I knew the moment I saw that average that my biggest issue was: I needed a nap. Maybe not just a nap. Maybe what I needed was to go back to doing what I shouldn’t have gotten away from doing in the first place: getting in a full night of sleep. 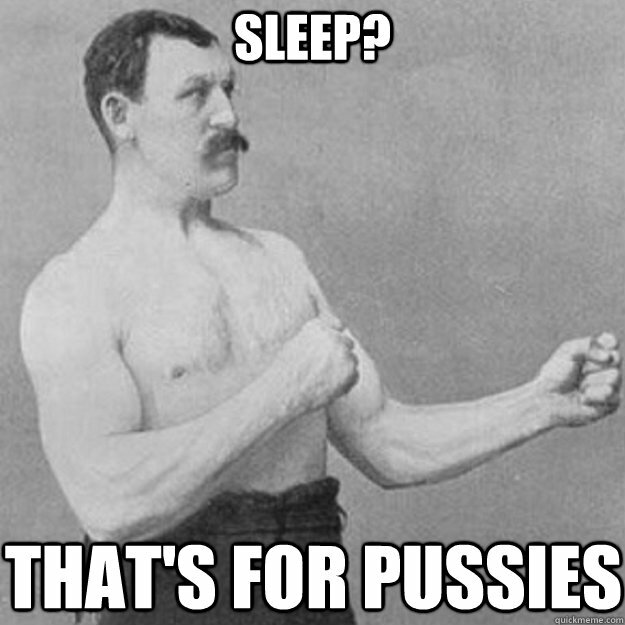 Sleep? I don’t need no stickin’ sleep! Oh… wait. Yeah, I do. I love sleep. There were times in my life after particularly stimulating events (weekend camp for 4-H teens, traveling to Washington DC for 4-H…. come to think of it, 4-H was responsible for most of my extreme exhaustion up through age 18) where I could easily sleep for 14 or more hours straight up. 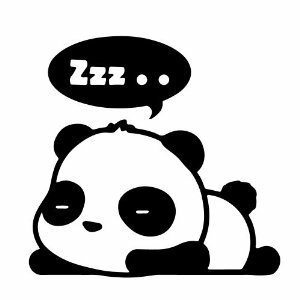 I discovered that to maintain myself as a happy panda, I needed to literally sleep 7-8 hours a night. Months of less than that had revealed themselves a few weeks ago when I replaced my makeup with gluten-free versions and included a stick of yellow concealer to camouflage the beginning of dark circles under my eyes. This was no good. Happily, the last 10 days of foregoing the early morning wake up and workout routine and getting the extra hours of sleep have helped out tremendously. The dark circles are going away. 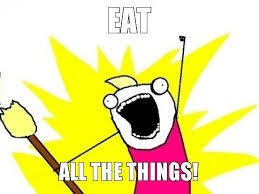 The overwhelming need to “eat all the things” has dissipated. And my naturally joyful nature? That’s coming back, too. Bonus, I haven’t gained weight – in fact it’s gone down. So let’s hear it for resting! Let’s give three cheers for napping! Go sleep! This entry was posted in Blogging, Fancy Coffee Friday, Musings, Personal and tagged 4-H, Belle of the Carnival, Belle of the Carnival blog, eat all the things, Fancy Coffee Friday, happy panda, Introverts overstimulation, joy, joyfullness, Master and Commander series, nap, napping, Patrick O'Brian, sleep, sleep and weight loss, sleeping. Bookmark the permalink. Amazing what a good nights rest will do for ones body !! 🙂 Now I too must find a way to do it!! Good luck! I’m still struggling with the guilt of not getting up and working out, but the sleep has been MUCH needed. I’m also struggling with not staying up reading later than I should but I am in love with the Master and Commander series of books! Here’s hoping you get a nap this weekend! I’ll have to wait and see – I’m headed into the weekend with a full schedule. At least it’s fun stuff. Taking a class with a friend and have a photo shoot. Sadly, I just don’t have enough hours in the day. Right now I’m transitioning to see what I can realistically get done in a day, which for my somewhat obsessive self, means that certain things just have to wait for a weekend to be done or don’t get done as thoroughly as I’d like to have them. Thankfully, I started back up on working out last night for 30 minutes so I can let go of my guilt on that subject. Yay for returning to normalcy! Obviously, I’m me, I’ll lament anyone losing exercise time, but if this is working for you, I’m ecstatic for you (honestly). Happy and well-rested and not-cranky are just about perfect, for anyone. Mondays/Tuesdays are killing me. My alarm goes off at 5am every weekday . . . choosing to wake later is certainly a possibility, but the damn dog’s internal alarm will wake him, and he’ll wake me, if I do anything different, so it doesn’t matter. So, Monday morning, I get up at 5am . . . I walk the one dog, feed the two dogs, work out, get myself ready for work, head to work, head to symphony, head home. On a good day, I’ll be home and in bed by 11pm . . . most Mondays, though, it’s closer to midnight. And then, the next morning, I’m awake at 5am. 5-6 hours, for a single night, isn’t horrible . . . but if I allow myself to think about how little sleep I’m about to get, I’ll keep myself awake. And that’s how we start the work week, and I spend the rest of the week just hoping to catch up. Gah. LOL John, I’m pretty good about not wanting to eat all the things all the time. Particularly if I’ve been good about laying off of sugary things, which i have to be more conscientious about since I have a shoot in Costa Rica in 5 weeks. That also means adult beverages are on the watch list due to all of those empty calories. You WILL be happy to know that exercise it back on the menu – just not as long as what I was doing.